Dr. Lawrence M. Saltzman and his team welcome patients to experience a gentle approach to dental care as well as effective, patient-specific treatment plans. Our Duluth practice offers everything that a patient might need to obtain a healthy and beautiful smile. It is our mission to deliver high-quality services to protect and maintain your teeth and their supporting structures. With modern dental techniques, along with a friendly environment, we ensure a patient’s comfort before proceeding with any treatment. If you are seeking a dentist that has the experience and commitment to help you achieve the smile you desire, call our practice to schedule an appointment and meet our friendly staff. 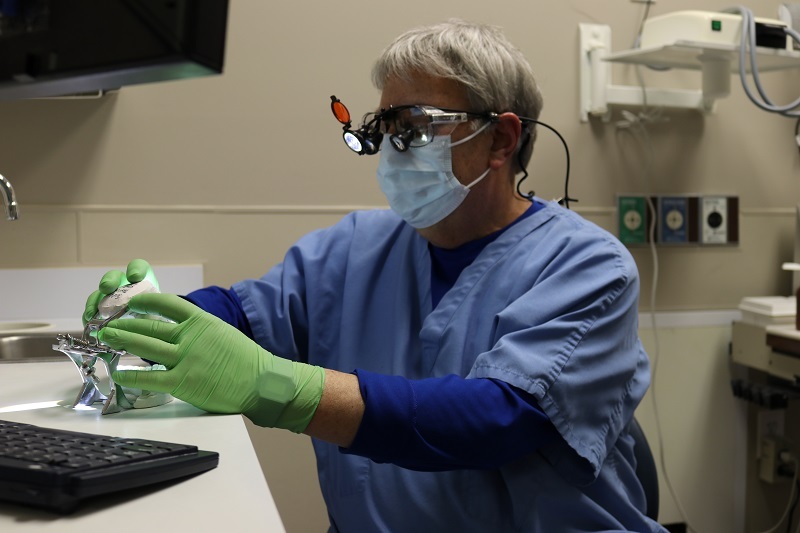 Our dentist has been practicing for over 30 years and most of his staff has been part of his team for at least 25 years and his hygienists for more than 30 years. His passion is guiding patients toward optimal oral health while taking a conservative approach when recommending treatments. Our dental office has built our reputation on providing good, quality, and comprehensive health care. Dr. Saltzman knows that dental health has an effect on overall well-being, so we do our best to address oral concerns early on to reduce the impact they could have on your smile and body. Dr. Saltzman in the dental lab. Dr. Saltzman and his staff treat every patient as family and view those receiving dental care as friends. We never stop striving to provide the best for our patients, so we continuously learn about what is new in the world of dentistry, whether it be technique or technology. For patients that need a little extra help relaxing, we offer warm blankets, stereo headphones, and nitrous oxide. This allows you to remain stress-free as you go about your treatment. With our gentle approach to dentistry and calming environment, we do our best to make every patient’s visit pleasant. While we never want a patient to feel rushed, we respect their time, conducting treatments efficiently. Visit Our Duluth Dental Practice Today! We want you to learn more about Dr. Saltzman, his staff, the office, and the services that we provide. Our team wishes to help you achieve the smile that you desire, so stop by our Duluth practice at the corner of Satellite Blvd. and Steve Reynolds Blvd. or call our office!